The longest running musical, seen by over 60-million people worldwide and a much loved novel by Victor Hugo… Director, Tom Hooper took on a mammoth challenge when he decided to direct Les Misérables, the film. He retained the musical format, which makes it a very different viewing experience, but also requires a little patience. At two-hours and forty-minutes, it is a long film with a lot of singing and even more heart. Les Misérables is nothing short of magic on big screen – it looks spectacular and has outstanding performances by all the actors, who performed their songs live on the sets and not lip-synched. It is a triumph for Hooper and his brilliant team of writers – William Nicholson, Herbert Kretzmer, Alain Boublil, Claude-Michel Schönberg (the last three are also behind the on-stage musical adaptation). After a spectacular start, the film does drag a bit in the second hour but the sincere and heart-felt performances by the actors keep you involved. Set in the nineteenth century France, Les Misérables begins with a man named Jean Valjean (Hugh Jackman) being released from a prison after serving a nineteen-year sentence for stealing a loaf of bread. He is marked as a dangerous man with a life-long parole, which he breaks and is pursued by a law-obsessed policeman, Javert (Russell Crowe). While Valjean gets a second chance to turn around his wretched life, a beautiful factory worker named Fantine (Anne Hathaway) is doomed after her co-workers find out about her illegitimate child. The film spans two-decades and we are introduced to numerous characters including Fantine’s daughter, Cosette (played by Isabelle Allen as a child and Amanda Seyfried as an adult); Cosette’s greedy care-takers, Madame and Monsieur Thénardier (Helena Bonham Carter and Sacha Baron Cohen); Thénardier’s children, Éponine (Samantha Barks) who is as old as Cosette and the young street urchin, Gavroche (Daniel Huttlestone); Marius (Eddie Redmayne) who loves Cosette and is also a student revolutionary along with Enjolras (Aaron Tveit). 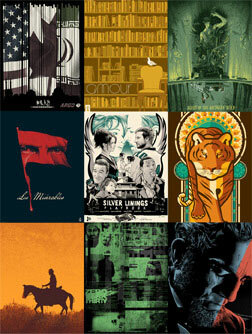 It is a great ensemble cast and I cannot point at one actor who did not live up to the characters they portrayed. The film opens with a prisoners’ song, “Look down” where we see hundreds of famished prisoners pulling a ship to its dock, while Javert supervises them. It is a grand visual with the sea, large ships and so many wretched souls including Valjean. The film strikes the perfect balance between real emotions and a magical setting, which is almost unbearably sad at times. The costumes, the wigs and make-up, the production design and cinematography are all first-rate and make it a spectacular viewing experience. The music is from the stage musical (lyrics – Herbert Kretzmer; music producers – Alain Boublil, Claude-Michel Schönberg) with an additional original song, “Suddenly” that is about Valjean finding Cosette and the sudden change in his life. It is performed beautifully by Hugh Jackman who is simply brilliant in the film. 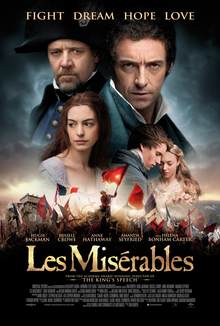 My other favorite songs in the film are Fantine’s “I dreamed a dream” in which Anne Hathaway confirms her Oscar shot; young Cosette’s “Castle on a cloud”, which has a haunting melody; the revolutionaries’ “Do you hear the people sing?”, which is still playing in my head and Valjean’s “What have I done?” Apart from Jackman and Hathaway, I loved what the two little kids brought to the film. Isabelle as Cosette looks exactly like the famous portrait by Emile Bayard from the original edition of the book and Daniel as Gavroche is the star in the last forty-minutes of the film. Special mention for Aaron Tveit who plays Enjolras with so much conviction that you almost forget to look at Marius. Les Misérables is made with passion, love and hope, which is visible on-screen. It may not be the most entertaining film you’ll see this year, but it is everything that great cinema can offer a true film-lover. If you like musicals then do not miss it on the big screen.